When I got home from the recent road trip, I discovered that Dean Keaton had been restriped, adding reverse-angle parking, bike lanes, zebra stripes, and a generally dizzying array of new road markings. On the day of David Byrne’s recent talk about bikes, I rode this newly restriped stretch of road and found it to be a disaster for bikes. The image above shows how the street looked before restriping. To be fair, this is an inherently difficult situation to make bike-friendly, especially westbound: there is a pullout for a city bus, an offramp, an onramp, and two places where traffic is turning across the lane. Not visible here is the fact that this is all happening on a downhill, so both bikes and cars are likely to be moving relatively fast (this stretch is signed as 30 mph, but the limit is rarely observed). Also not visible is another intersecting offramp just to the west. As shown here, the street has two lanes, with a third lane for merging offramp traffic. After restriping, there is one lane on the left, a no-man’s-land denoted by zebra stripes, and a bike lane on the right; there’s a second lane for merging offramp traffic. The way the bike lanes have been striped makes them an absolute hazard. 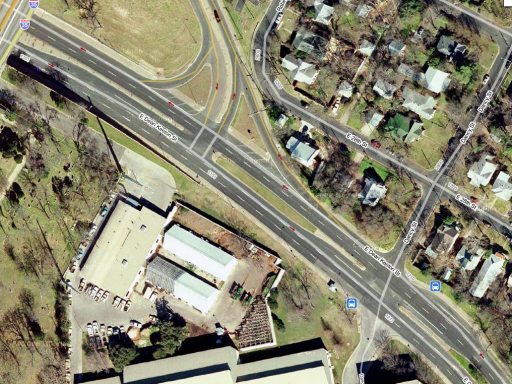 The bike lanes zig-zag across onramp and offramp traffic in a way that minimizes the crossing distance. This runs contrary to both my own intuition and effective cycling methods, where the cyclist holds a straight line across the onramp/offramp. Worse perhaps is the quality of the pavement: although the pavement in the main travel lanes is in good shape, pavement in the bike lane is very rough. As a cyclist, I am skeptical of bike lanes in general. They seem to be designed to cater naïve riders, who don’t know how to conduct themselves in traffic, and more than that, to motorists, who don’t want to be forced to deal with bikes at all. Many motorists will interpret the existence of a bike lane as a requirement that bikes ride in it, even when it is impassable. And naïve riders will follow bike lanes, even when they’re laid out poorly. That said, there can be good bike lanes and bad bike lanes. This is a bad one. A motorist taking the onramp or offramp will come up fast on a cyclist staying inside the lane, who is swerving and cutting perpendicularly across the motorist’s path at the same time. The choppy road surface set aside for the cyclist clearly reflects our second-class status. And the plethora of dashed lines, zebra stripes, chevrons, etc, all serve to confound everybody. That night, I went to David Byrne’s presentation. One of the speakers was the City of Austin Bicycle Coordinator, Annick Beaudet. She spoke proudly of some of the city’s new bike facilities. Including this one. I can understand a city bureaucrat taking pride in seeing a project to completion, but I have to wonder: has she actually ridden this stretch of road? See also: How not to design a bike lane. 1 – regarding where the lanes cross the ramps – these will be painted a solid green as an extra visual indication to drivers that they are crossing a bike lane. 2 – bike lanes in general – bike lanes = more cyclists. more cyclists = safer cycling for everyone. motorists get used to cyclists on the road. eric, you have to come with better stuff than that against somebody with as much experience as Adam. Adam, I too have problems with some of the transition points in this striping design – which is weird since for the most part they’ve gotten quite good at doing the best possible with right-turn transitions over the last few years. There are arguments for bike lanes in this area that go beyond the normal Foresterite territory – for instance, on Speedway up near my house, the bike lanes allow the road to carry far more people than it would without the bike lanes (by, unfortunately true, ‘encouraging’ cyclists to stay right). Those thousand bus passengers per hour deserve a chance to get to work or school too. 1. While I can imagine that green lanes will reduce the visual confusion, they will not improve the path that cyclists are being guided down. Motorists should be looking at the riders, not the bike lanes, so from the motorist’s point of view, I don’t expect this will make much difference. 2. I can appreciate that more cyclists makes cycling safer. I do not accept that more bike facilities automatically encourages more biking, any more than I accept that more calories automatically makes for a good meal. If you had the guy who designed I-35 design Austin’s bike lanes, you could get Amy Babitch to give up bikes as a bad idea. What I’m saying is that good bike facilities may encourage more biking. This is not a good one. I would expect a naïve cyclist to be frustrated or frightened by it, and an experienced one to ignore it.